Haven’t we had the most glorious weather this summer? Yes, rather hot on some days, but definitely one to remember! We are always looking for more ways of helping people discover more of the country life in the city and what could represent our capital more than the iconic Red Routemaster vintage buses? 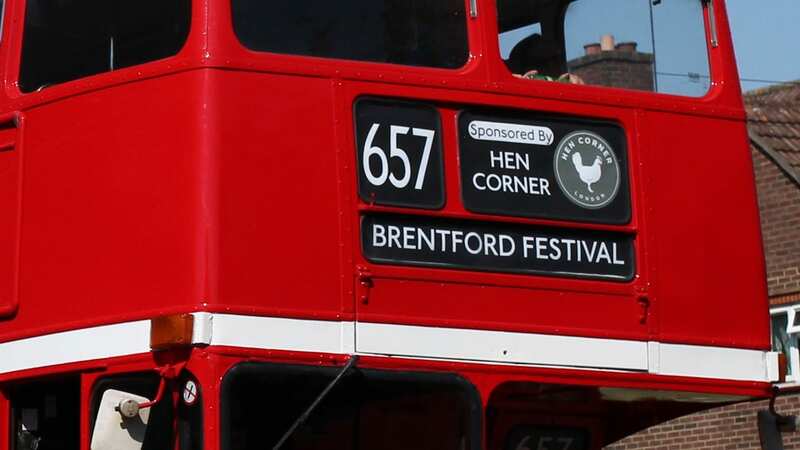 So when we were given the opportunity to sponsor a whole route of them transporting visitors for free to the local Brentford Festival, we couldn’t miss that opportunity. On the day, I was volunteering on the information stand and brought a few hens along to meet the festival visitors – they were a fantastic distraction for a little boy who had lost his mum, fortunately, it wasn’t long before they were reunited. We’ve loved the sunshine which has been perfect weather for our family courses over the summer holidays; seeing little people donned in full bee suits and confidently holding frames of live bees from the hive, whilst parents look on in trepidation, always makes me smile as they are making memories that they’ll never forget as they explore the wonders of the world around us. In general, the bees have kept us very busy this year, both with course guests and schools groups and making their wonderful honey. We haven’t weighed it all yet, but have two different varieties and a bumper crop, we have entered quite a bit into the National Honey Show so will spend time preparing it and hope for another award or two. Sadly, the recent heatwave was too hot for the hens. Butternut, our gorgeous Buff Orpington, just couldn’t manage the 34c with her big fluffy feathers and died of heat exhaustion, so to protect the others, we started putting blocks of ice (freezing big bottles of water) into their coops to cool them down. We’ve had a move around with the Eglus and have bought some new hens so, with 10 Bantams, 8 Hybrid and 7 Pure Breeds, we are now up to 25 hens at the ‘Corner. There seem to be more and more people interested in keeping chickens in London, our courses have been fully booked this year and Sean Fletcher from BBCOne’s Inside Out came to talk to us to find out why. The episode that features Londoners living the Good Life by keeping hens is on Monday 17th Sep, 7.30pm, more details can be found here. Whilst our evening sessions of Urban Hens – Keeping Chickens in London are coming to a close, because the chickens go to bed at dusk, we’ve scheduled in dates for next year when the days are longer and we look forward to sharing the joys of chooks to all who come to join us. For younger chicken fanciers, we have Families, Feathers & Fun on Saturday afternoons throughout the year – Come and join us to #HugAHen? How will you be celebrating Autumn and what’s your favourite locally produced food?